The recent edition of The Final Call newspaper is out and filled with our year in review coverage from 2011 with a look ahead into what could be in store for 2012. One very impressive feature is the recap of the non-stop works and warnings of the Honorable Minister Louis Farrakhan throughout the year. Ashahed M. Muhammad, Final Call Assistant Editor, had the blessed honor of having his byline on just about all of those stories plus he traveled with the Minister alot! He had an epic year of writing and that's why he gets my vote for Writer of the Year. Read his recap here. 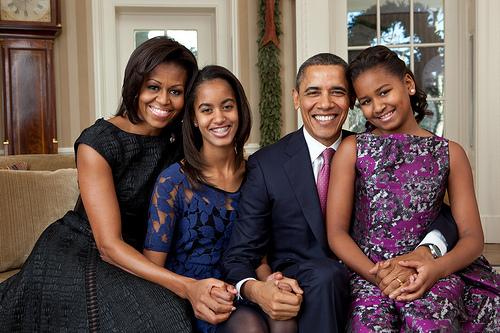 While some pundits still contend having a Black family as the first family of the United States the past three years points to a “post-racial” society, 2011 ends pointing out even the president and first lady cannot escape the racial animus that continues to permeate the very fabric of the world’s most powerful nation. Congressman Jim Stensenbrener (R-Wisc.) was recently overheard making inappropriate remarks about First Lady Michelle Obama’s backside, harkening back to the days when White slavemasters commented on the physique of Black slaves as they stood on the auction block prior to being sold off. In a separate incident, former Tea Party political candidate Jules Manson was visited by the Secret Service after reportedly calling for the assassination of President Obama and his “monkey children” on his Facebook page as reported by the New York Daily News. Incidents like these show racism is still a virus in society even in 2011 Rev. Marcia L. Dyson told The Final Call. “I think we haven’t come as far in race relationships. Electing a Black man for president is about choosing one Black man but it has nothing to do with how they really may think about African Americans in general,” says the ordained minister and lecturer. “Obviously if a non-Black said it, they still have a fixation on the Black female body, something that they can no longer have as chattel. So since you can’t lock it down in iron you can try to throw straws at it. But Michelle Obama is a fierce Black woman from the South Side of Chicago and has more grace to even be insulted by the ignorance of a few in America,” says Rev. Dyson when asked about the comments made by Rep. Stensenbrener.